ACCIONA Green Energy markets electricity with a 100% renewable Guarantee of Origin, accredited by the CNMC (National Markets and Competition Commission). ACCIONA Green Energy Developments is the Spanish representative – not dominant operator – with the highest volume of energy negotiated on the market. It offers its customers security and stability by belonging to a financially sound Spanish business group with no credit risk and a long track record that plans to stay in the sector. Furthermore, it is the only Representative Agent that manages technologies in the General and Specific Regimes, which gives it a broader market vision. ACCIONA Green Energy operates in the OMIP futures market and in the OTC markets, which means it learns about the evolution of the futures market in real time and can inform its customers about the main trends. ACCIONA Green Energy also manages the ACCIONA Group’s own CO2 credits portfolio (CDM projects and allocations to facilities affected by the Spanish National Allocation Plan 2008 - 2012) and offers access to third parties to the carbon market (purchase and sale of emissions allowances, swap transactions, EUAs/CERs, etc.) and it negotiates bilateral coverage of energy with independent producers. ACCIONA Green Energy is ISO certified (ISO 9001 - Management Quality, ISO 14001 – Environmental Management Systems) and also holds OHSAS 18001 (Occupational Health and Safety Management Systems). Marketing activity within ACCIONA Green Energy has multiplied four times in the 2011–2016 period. It is mainly oriented to the business sector, with flexible products adapted to our customers’ needs. In 2017 we supplied 5 GWh. ACCIONA Green Energy’s sales portfolio in the market is based on the energy generated by the ACCIONA Group, which gives the company an exceptional platform from which to make competitive offers to its customers. 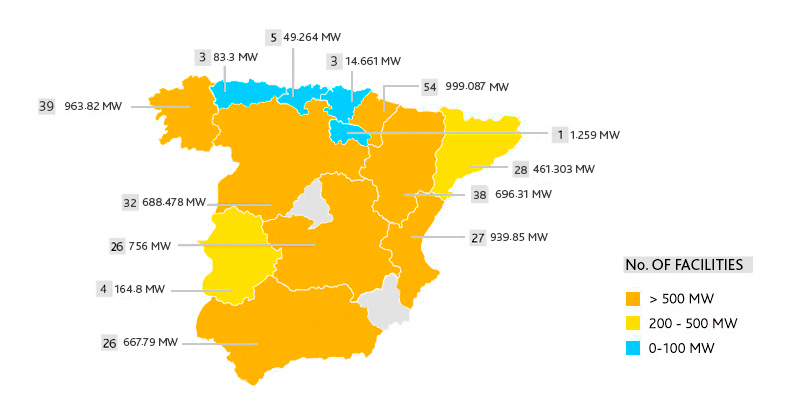 The volume of energy sold in the market by ACCIONA Green Energy, 15,027 GWh in 2017 –equivalent to the consumption of more than 4 million Spanish homes-, and the wide range of technologies and the geographical dispersion of its wind farms give ACCIONA Green Energy’s portfolio a stability its customer can benefit from, through lower diversion costs thanks to the portfolio effect. The table below shows a breakdown of the portfolio of installations managed by ACCIONA Green Energy and the corresponding capacity at 31 December 2017, over 6,540 MW.